WASHINGTON (AP) — Uncompromising and politically emboldened, President Barack Obama urged a deeply divided Congress Tuesday night to embrace his plans to use government money to create jobs and strengthen the nation’s middle class. He declared Republican ideas for reducing the deficit “even worse” than the unpalatable deals Washington had to stomach during his first term. In his first State of the Union address since winning re-election, Obama conceded economic revival is an “unfinished task,” but he claimed clear progress and said he prepared to build on it as he embarks on four more years in office. “We have cleared away the rubble of crisis, and we can say with renewed confidence that the state of our union is strong,” Obama said in an hour-long address to a joint session of Congress and a television audience of millions. NewsHour political analysts Mark Shields and David Brooks discuss their reactions to the State of the Union and Sen. Marco Rubio’s Republican response with senior correspondent Judy Woodruff. Yet with unemployment persistently high and consumer confidence falling, the economy remains a vulnerability for Obama and could disrupt his plans for pursuing a broader agenda, including immigration overhaul, stricter gun laws and climate change legislation. In specific proposals for shoring up the economy in his second term, an assertive Obama called for increased federal spending to fix the nation’s roads and bridges, the first increase in the minimum wage in six years and expansion of early education to every American 4-year-old. Seeking to appeal for support from Republicans, he promised that none of his proposals would increase the deficit “by a single dime” although he didn’t explain how he would pay for his programs or how much they would cost. Sen. Rubio, in prepared remarks, said presidents of both parties have recognized that the free enterprise system brings middle-class prosperity. Still, throughout the House chamber there were symbolic displays of bipartisanship. Rep. Tammy Duckworth, D-Ill., arrived early and sat with Sen. Mark Kirk, R-Ill., just returned in January nearly a year after suffering a debilitating stroke. As a captain in the National Guard, Duckworth lost both her legs while serving in Iraq in 2004. A few aisles away, the top two tax writers in Congress, Rep. Dave Camp, R-Mich., and Sen. Max Baucus, D-Mont., sat together. But as a sign that divisions still remain, three of the most conservative Supreme Court justices skipped Obama’s speech. Six of the nine attended. Missing were Justices Clarence Thomas, Antonin Scalia and Samuel Alito. 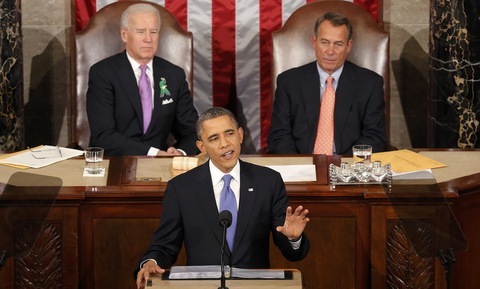 Jobs and growth dominated Obama’s address. Many elements of his economic blueprint were repacked proposals from his first term that failed to gain traction on Capitol Hill. Standing in Obama’s way now is a Congress that remains nearly as divided as it was during the final years of his first term, when Washington lurched from one crisis to another. Yet Obama offered few signs of being willing to compromise himself, instead doubling down on his calls to create jobs by spending more government money and insisting that lawmakers pay down the deficit through a combination of targeted spending cuts and tax increases. But he offered few specifics on what he wanted to see cut, focusing instead on the need to protect programs that help the middle class, elderly and poor. He did reiterate his willingness to tackle entitlement changes, particularly on Medicare, though he has ruled out increasing the eligibility age for the popular benefit program for seniors. Republicans are ardently opposed to Obama’s calls for legislating more tax revenue to reduce the deficit and offset broad the automatic spending cuts – known as the sequester – that are to take effect March 1. The president accused GOP lawmakers of shifting the cuts from defense to programs that would help the middle class and elderly, as well as those supporting education and job training. “That idea is even worse,” he said. Obama broke little new ground on two agenda items he has pushed vigorously since winning re-election: overhauling the nation’s fractured immigration laws and enacting tougher gun control measures in the wake of the horrific massacre of school children in Newtown, Conn. Yet he pressed for urgency on both, calling on Congress to send him an immigration bill “in the next few months” and insisting lawmakers hold votes on his gun proposals. Numerous lawmakers wore green lapel ribbons in memory of those killed in the December shootings in Connecticut. Among those watching in the House gallery: the parents of 15-year-old Hadiya Pendleton, shot and killed recently in a park just a mile from the president’s home in Chicago, as well as other victims of gun violence. On the economy, Obama called for raising the federal minimum wage from $7.25 to $9 by 2015. The minimum wage has been stagnant since 2007, and administration officials said the increase would strengthen purchasing power. The president also wants Congress to approve automatic increases in the wage to keep pace with inflation. Obama also renewed his calls for infrastructure spending, investments he sought repeatedly during his first term with little support from Republicans. He pressed lawmakers to approve a $50 billion “fix it first” program that would address the most urgent infrastructure needs. Education also figures in Obama’s plans to boost American competitiveness in the global economy. Under his proposal, the federal government would help states provide pre-school for all 4-year-olds. Officials did not provide a cost for the pre-school programs but said the government would provide financial incentives to help states. A $1 billion plan to create 15 “manufacturing institutes” that would bring together businesses, universities and the government. If Congress opposes the initiative, Obama plans to use his presidential powers to create three institutes on his own. Doubling of renewable energy in the U.S. from wind, solar and geothermal sources by 2020. Tuesday night’s address marked Obama’s most expansive remarks on the economy since the November election. Since securing a second term, the president has focused more heavily on new domestic policy proposals, including immigration changes and preventing gun violence following the horrific shooting of schoolchildren in Newtown, Conn.
Obama also called on Congress to tackle the threat of climate change, another issue that eluded him in his first term. The president pledged to work with lawmakers to seek bipartisan solutions but said if Capitol Hill doesn’t act, he’ll order his Cabinet to seek steps he can take using his presidential powers. Obama also called on Congress to pass legislation giving the government more power to combat the rapidly growing threat of cyberattacks. And, as a down payment on that, the president announced that he has signed an executive order to fight electronic espionage through the development of voluntary standards to protect networks and computer systems that run critical infrastructure. Associated Press writer Nancy Benac contributed to this report.